PHPKB is most popular knowledge base software that keeps information organized, accessible, and easy to manage for internal teams and external customers. Use our knowledge management software to set up a knowledge base and share information, documents, files, FAQs, how-to guides, and training material with staff & customers in the highly organized way. PHPKB offer important decision-making knowledge base statistics that uses graphs and charts to display important statistics about the knowledge base to the knowledge managers in a professional manner. An easy to use, intuitive knowledge base software that encourages customers to help themselves. It gives the customer the opportunity to solve issues easily while not engaging your technician’s time. PHPKB knowledge management software provides your business with the knowledge sharing platform and required features to share right knowledge with your internal staff and end users at the right time. Updated software documentation and usage manual released. PHPKB is a knowledge base management software that allows you to share information with your customers and staff members. It reduces the time spent on customer support, improves the productivity of employees and saves precious time wasted on searching for information. A knowledge base system enables your staff and customers to access information locally or online. Its powerful group-based permission structure with private categories makes it easy to target and deliver, content to specific groups of knowledge base readers. Put simply, PHPKB is the most scalable and performant knowledge management software available. Wish to see it live in action? Check out the live examples of PHPKB software on customer websites. PHPKB is a powerful and robust knowledge base software for your business to locate, capture and share information with your team. PHPKB provides a range of advanced knowledge management features that enable your business to handle customer support more efficiently. Plus, it is reasonably priced for a lifetime license that means you'll never have to pay an annual license fee to keep using it. PHPKB is available as self-owned or hosted license that means you can either install PHPKB software on your own server or you can use our hosted knowledge base service where we host your knowledge base on our server. 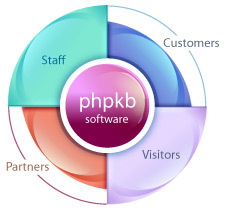 Not to mention, our hosted SaaS service makes PHPKB the best cloud-based knowledge management platform in the world. PHPKB is a modern knowledge management software that allows you to quickly set-up the knowledgebase and starts organizing your organization's knowledge. It lets you save time on onboarding new support representatives and respond faster to customers as a team. It is developed in PHP and supports both MySQL and SQL Server databases. It allows you to set up a knowledge base that contains answers to frequently asked questions, articles, white papers, user manuals, troubleshooting information or documents. The powerful full-text search system help users to easily locate information in the knowledge base articles, attached files, and documents. Have a look at the features of knowledge base software. In a recent customer satisfaction survey, 99% of PHPKB customers surveyed said they would recommend PHPKB knowledge management software to their friends and colleagues. We work hard to make sure our customers are happy. To learn more about PHPKB Knowledge Management Software, have a look at the features page. You are most welcome to try the live demo. You can also compare editions or view the pricing of different editions. To speak with a sales representative, please contact us. Some of the world's most trusted companies trust our knowledge base software. A knowledge base is designed to organize and present the most commonly asked customer questions and an explanation of how to solve them. It stores answers to frequently asked questions, how-to articles and troubleshooting information. Improve your customer support service and enable your customers to quickly and easily locate knowledge base information in a self-serve help manner. The web-based self-help interface makes it easy for customers to find answers to their own problems instead of sending emails, submitting support tickets or calling your customer support department. A knowledge base can also keep customers updated with news, announcements, product releases, and updates. PHPKB knowledge base software is already in use by over 2,500 small businesses, universities, non-profits and enterprise organizations. Do you wish to set-up your knowledge base in multiple languages? Look no further! The multi-language edition of PHPKB knowledge base software allows you to set-up your knowledge base in multiple languages. The multi-language edition comes with the ability to create language files & translate language file variables from within the admin control panel. Al right-to-left (RTL) languages are also supported. As a business in the 21st century, providing great customer service is getting challenging. Your customers are getting smarter, more demanding, and you need to keep up with the pace. Use PHPKB to create online help manuals which explain steps clearly using images and structured table of contents. Simplify the documentation with tooltips and by cross-referencing other helpful articles. We have automated import scripts for all the major knowledge base management systems which make switching to PHPKB really easy! But that's not all, if you own a commercial license of any competitor's product, we will gladly offer you flat 15% discount. PHPKB knowledge management software is intuitive and extremely easy to use. Make the switch today and establish yourselves as the pioneers of good customer support. Reduce expenditures on support and also get a smoother experience. PHPKB has been such a fantastic tool for knowledge management. Integration was easy in our template and it was up and running in minutes. KB reports are great, and the powerful WYSIWYG editor allows us to easily integrate videos, images and other media files in our KB articles. If you're looking for a flexible, open and reliable Knowledge Base, look no further.